CocktailMom: Happy 60th Birthday Tom! My MIL, Gini, is taking my FIL, Tom, on a surprise vacation for his 60th b-day. This trip is special because she is recreating the exact trip they took when Tom proposed to her. Gini spoke with Jon and I about making cards that she could give him each night at dinner to give him clues as to what is in store for the next day. Jon creates the words and I create the actual card and together we brainstorm the concept. It truly is a gift from the both of us. The first day is a cable car since they are flying to San Francisco. 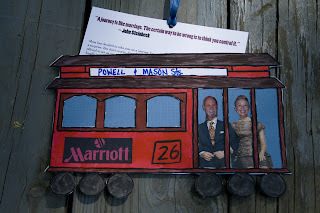 On the cable car I added personal details; the number 26 is how many years it has been since they took this trip, the Marriott hotel ad is the hotel where they will be staying. The cable car line on the top of the car is the line that takes you to the Fisherman's Wharf where they will be having dinner. And I used Gini and Tom's heads on a cut out from a magazine. 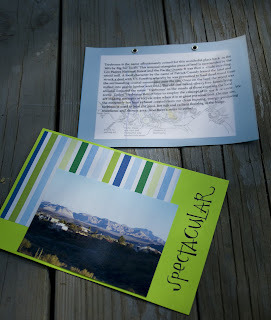 I made the cable car into an envelope and when you pull the ribbon, the card attached is a letter Jon wrote to Tom explaining what we are doing. Here are some of the other "cards" we made. 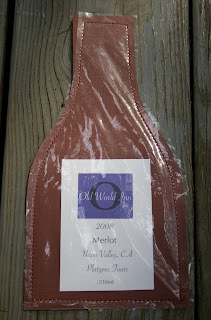 The wine bottle is made from textured card stock with clear vinyl sewn on the top, for when they go to Napa and take a tour of a winery. 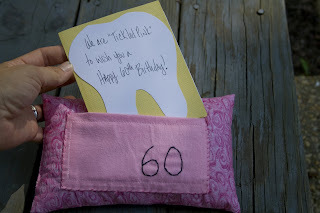 The tooth fairy pillow is because during the original trip Gini had an abscess tooth and had to see an emergency dentist in Carmel. It was a lot of fun making these, hopefully it will inspire you to think outside of the box the next time you have to make a card. What a great gift and it comes from the heart.